We’re excited to inform our clients that we have recently upgraded our in-house diagnostic lab equipment! These new state of the art analyzers allow for more efficient and accurate in-house results and also integrate seamlessly with our patient software Cornerstone. The Vetlab Station provides us with all diagnostic results in one convenient place. It is the control center for all the analyzers discussed below and uses two-way integration technology to synchronize, organize, and display in-house diagnostics automatically, enabling real time care. 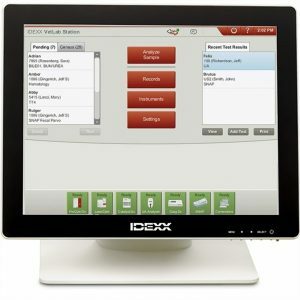 It eliminates manual data entry, ensures every charge is captured, records results in patients’ records, and integrates seamlessly with Idexx’s online platform VetConnect PLUS. 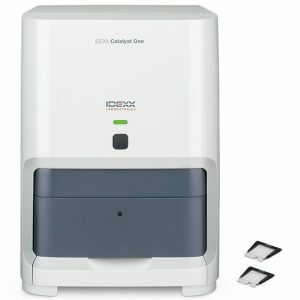 The Catalyst One Chemistry Analyzer allows for unprecedented clinical insight in one run with one sample and chemistry and electrolyte results are available in only 8 minutes. It has an expansive menu of 32 tests including advanced diagnostics like fructosamine, total T4, phenobarbital, urine protein:creatinine ratio, and SDMA. 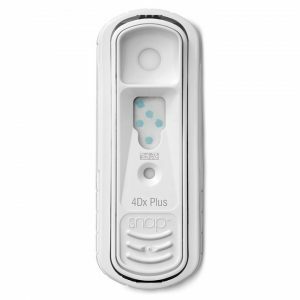 Its dry-slide technology ensures accurate results even from compromised samples. 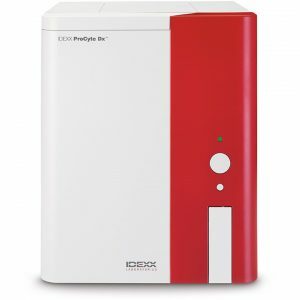 The ProCyte Dx Hematology Analyzer offers in house hematology with reference lab quality results in real time. It employs three cutting-edge technologies to provide the most comprehensive complete blood count (CBC) available in house. It’s the first and only in-house hematology analyzer that provides accurate results in just two minutes. This analyzer generates dot plots as a visual representation of the complete blood count (CBC) for easy interpretation and validation of results. It gives 27 whole-blood parameters, an advanced five-part white blood cell differential, RETIC-HGB, presence of band neutrophils and nucleated red blood cells (nRBSs), as well as body fluid analysis. 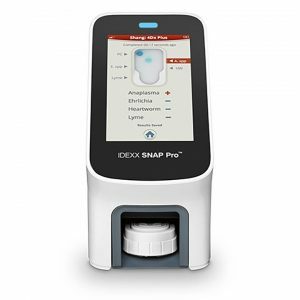 The SNAP Pro Analyzer delivers superior diagnostic accuracy and utilizes ProRead software and automatically activates, times, and interprets SNAP test results. It allows the user to view interpreted results at a glance for quick, accurate health assessments and better staff efficiency. 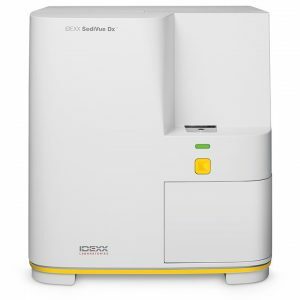 The SediVue Dx is the new standard for urine sediment analysis. It delivers consistent, accurate results in approximately 3 minutes from only 165 uL (4-5 drops) of fresh, uncentrifuged urine and examines the equivalent of 45 high-power fields, then identifies and classifies elements within the sediment. The SediVue Dx produces high-resolution, high-contrast digital images that can be shared in real time and also leverages cutting-edge Neural Network 3.0 technology to better identify abnormalities with each result generated. It can detect: red blood cells (RBCs), white blood cells (WBCs), squamous epithelial cells, nonsquamos epithelial cells (ie: transitional cells, renal tubular cells), bacteria (rods and cocci), casts (hyaline, nonhyaline), and crystals (struvate, calcium oxalate dihydrate, and more). 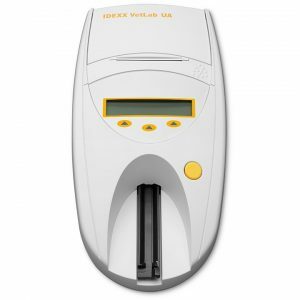 The VetLab UA Analyzer automatically reads and captures urine strips, saving time and eliminating errors with one-button operation and results in about 80 seconds. It improves results with consistent interpretation and color compensation for darkly colored samples, automatically captures strip results, and integrates with the patients’ medical records and invoices. It reads: pH, leukocytes (LEU), protein (PRO), glucose (GLU), ketones (KET), urobilinogen (UBG), biliruben (BIL), and blood/hemoglobin (BLD/HGB). We’re thrilled to be able to provide the highest standard of care for your precious pets and this new, state of the art lab equipment will play a crucial role in doing so! Please let us know if you have any questions and be on the lookout for a new video coming soon showing you just what happens when we run in-house diagnostic labwork on your pet!